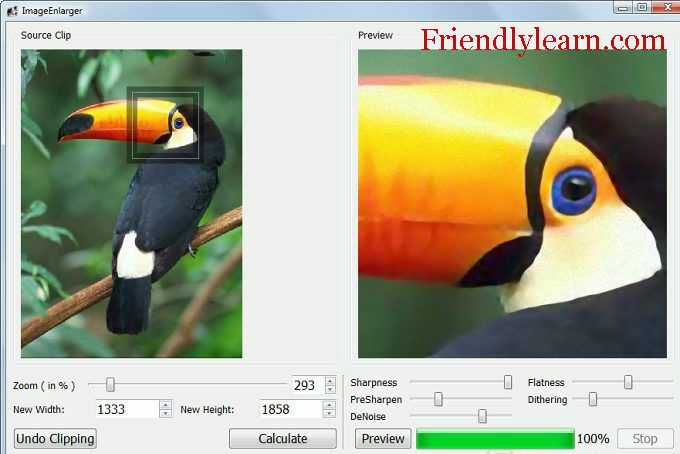 SmillaEnlarger is an Open Source program that enables you produce quality enlargements of yourdigital photos. It enables you to convert a low resolution image into a high resolution copy while maintain as much of the details as possible and minimizing image noise. You can also clip a portion of your photo and create a high quality crop with the same or higher resolution than the original. SmillaEnlarger offers several adjustment options and an instant preview to inspect the results. 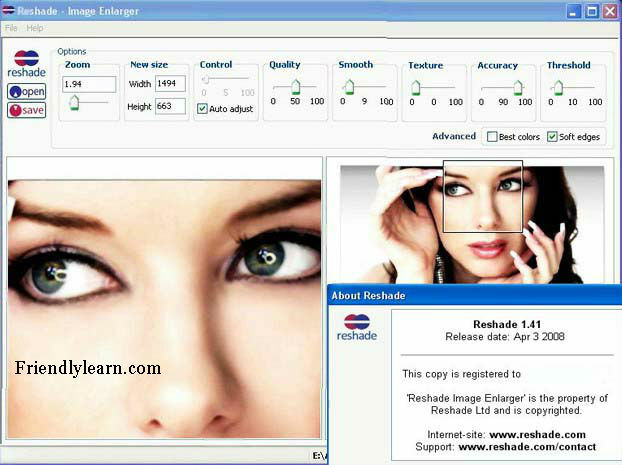 Reshade eliminates most of the problems faced during photo enlargement process such as pixelation, loss of focus, loss of sharpness, exagerated noise . Reshade also comes with an online service to resize the images. You can make the image smaller or enlarge it. The Desktop Version of Reshade is not free and it costs 149$ to buy and there is a premium online service too which offers similar features of the desktop application. I am dealing with the free online service of reshade since it is free and does a decent job. It is adequate for home use. Professionals may require the paid version. You can use the Reshade service with or without an account but the features will vary. It is free to create free account with reshade and it provides some more features. Signing up for a free Reshade account offers you the ability to enlarge images to a maximum resolution of 1920x1200px with a zoom of 2X.